Powerblade Pro 125 is a premium race skate with all the best components. It is great for skating marathons and developing advanced skating techniques. The boot is handmade in Italy by reknown boot maker Davide Mariani and has one of the best fits available. It is even better once the heat moldable carbon shell is customized to the skaters foot. Proper instructions for this process are included and easy to follow. 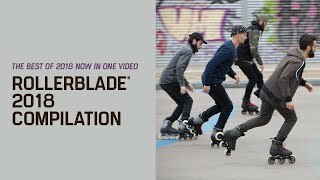 3WD frames give skaters the extra competitive advantage with faster speed, more efficiency, increased maneuverability, less vibration and a better roll. Hydrogen wheels and Twincam bearings are considered leaders in their categories because their products perform extremely well. Roll further and faster in the Powerblade 125 3WD, Brakes are not typically used with race skates given the nature of the sport. - RACE SKATE is specially built to enhance the race and skate experience. Made for all speed applications, this skates handmade custom fit and premium components meet the demands of any racer. - HEAT MOLDABLE CARBON BOOT for a custom, anatomical fit that increases power transfer and response. The microfiber upper adds durability and a nice clean aesthetic.